Last summer I had the opportunity to visit my wife’s native land, the beautiful Ukraine in eastern Europe. During our stay with her family, we visited the capital city Kiev, journeyed through the evergreen trees and natural springs of the Carpathean Mountains, and went to a historical Church. It was coated with blue walls and round topped domes lustered with gold. After going inside the lavished Cathedral, we gazed at the intricate portraits of saints, marbled floors, and smelled numerous incenses burning around the entire square block of the building. To the left, there was this prayer box similar to one at a movie theatre. It had a priest dressed up in a black vesture with a long white beard. There was a line of fervent visitors emptying their pockets and handing their money in full to the priest. There was a sign which listed the price of how much each prayer cost. If you wanted someone to pray for your spouse or have a service in your name, it cost extra. The only exception was the one being prayed for could not be a harlot, drunkard, or any other denomination outside of theirs. Right then, I realized that their god was not the living Creator of the Heavens and the Earth, but the idol of money and power. They were fashioning their god by creating buildings with larger domes, pillars, and jewels, rather than sharing their earnings with the old crippled man and widow begging at the entrance of the gate. Jesus said that a pure and undefiled religion is to visit the orphans and widows in distress, and to be unspotted from the world. The same type of idolatry was also happening during the book of Judges between Micah and the Levite. Read Judges 17:1-13 and we will analyze the text and apply it to our own situation today. At the beginning of the period of Judges, the Israelites had difficulty with escaping the temptation of foreign gods in the land, but now their moral compass completely collapsed. In chapter 17, a new idea emerges. God’s people are manufacturing their own idols and false gods, starting with Micah the Ephramite, the help of his mother, the Levite who attended Micah’s shrine, and the Danite tribe. Israel became much different than it was during the time of Joshua. Instead of cult sites on hills being destroyed in Israel they were being constructed. Instead of idols being cut down, they were being manufactured. Even the central shrine for Yahweh is placed by Micah’s false god. The second truth is the corruption of the Levitical Priesthood. The Levite was a young man from the clan of Judah. Although this young man was a descendent of Levi, he violated his call in many ways. First, he did not determine to dedicate his allegiance to Yahweh, but worship any deity that would give him prestige, which was Micah’s god of ten shekels and a shirt. Third, he does not serve at the place of Yahweh’s choosing but at a place chosen by a man. Moreover, he does not receive an honorarium (Deut. 18) where the Lord is his inheritance, but worships temporary silver, food, and clothes. Lastly, he lusts for power just like Micah did when he was captured by the Danites. They said to him, “Is it better for you to be a priest to the house of one man, or to be priest to a tribe and a family in Israel?” Then it states here: “The priest’s heart was glad, and he took the ephod and household idols and the graven images and went among the people. The Levite not only worshipped Micah’s false god but encouraged others to do the same. This man has no passion for God. In the end, you notice the wandering Levite succeeds as the high priest of the Danite cult shrine, and the Danites succeed in conquering land even though they never called on God for help. How often can we be like the Levite. It is easy for us to point our fingers at the secular realm when they build multimillion dollar stadiums to house their sport gods, buy LCD flatscreen Televisions and sit to worship the entertainment god, or attend the innumerable fast-food chains to serve their idol of gluttony. 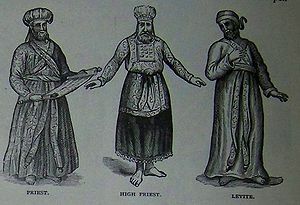 Is it possible for us to be like the Levite, who will be an actor of religion for ten shekels and a shirt in order to have a good salary? Are you finding a ministry position, not because you are called to go somewhere, but because it offers full-benefits and are tired of having menial jobs? Can we be tempted to grow our church attendance, not for King Jesus’ sake, but so we can have more Danites worshipping us, following our tweets, and broadcasting our sermons? What kind of change does God want from us? He doesn’t want us to worship idols because He knows they can’t ultimately satisfy our heart’s desires. We are created to worship God and enjoy Him forever. King Solomon had everything that the natural man could want: power, fame, fortune, but he ultimately said in the end that all of it is meaningless and chasing after the wind (Ecc. 1:14). Instead, pursue Christ by reading His Word, obeying his commands, praising Him in spiritual songs and hymns, and letting Him be the King of your heart. He is the only God that truly loves us because He took the wrath of God in our place so that we could enjoy eternity with Him.